Have your dessert first, make this Peach Pie Martini for happy hour. 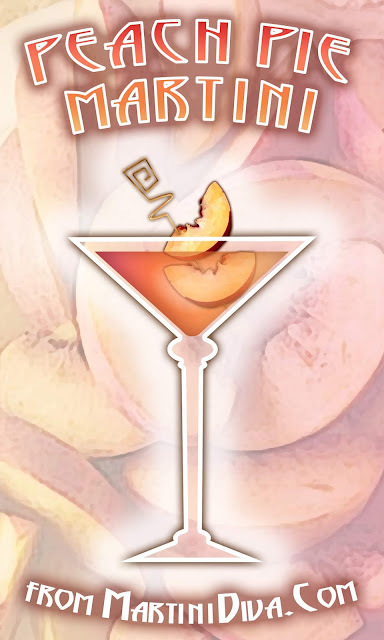 The essence of a slice of peach pie lies in the peach vodka, peach juice and the cinnamon sugar rim. A little vanilla vodka and some half & half and you have peach pie in a glass. Mix 1 tablespoon each of cinnamon and raw sugar together. Dip glass rim in some peach juice then into the mixture. This should probably have been called the Peach Pie Ala Mode Martini because the half & half brings in the creamy element that ice cream would bring to a piece of peach pie. Don't like pie ala mode? Leave out the half & half. If you can't find peach vodka you can use 1 ounce of plain vodka and 1/2 ounce of a peach schnapps OR . . . you can infuse your own peach vodka by reading my post How to Make Your Own Flavored Vodkas. National Peach Pie Day is August 24th.